This challenge is similar to Project Euler problems. I came up with it because I was playing a deceivingly simple board game and couldn't come up with an efficient solution to answer a simple question about its mechanics. Quarto is a fun variant of 4 in a row. It is played on a 4 by 4 board with 16 unique pieces (no pieces are duplicated). Every turn each player places 1 piece on the board. Each piece has 4 binary characteristics (short/tall, black/white, square/circular, hollow/solid). The goal is to make four in a row, either horizontally, vertically or along the 2 diagonals, for any of the four characteristics! So 4 black pieces, 4 white pieces, 4 tall pieces, 4 short pieces, 4 square pieces, 4 circular pieces, 4 hollow pieces or 4 solid pieces. The picture above shows a finished game, there is a four in a row because of 4 square pieces. 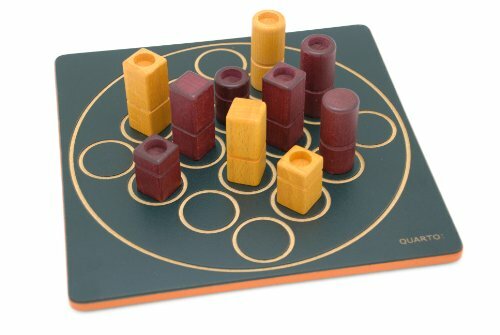 In Quarto, some games may end in a draw. The total number of possible end positions is 16!, about 20 trillion. How many of those end positions are draws? You may only use information of the rules of the game that have been deduced manually (no computer assisted proof). Mathematical simplifications of the problem are allowed, but must be explained and proven (manually) in your solution. The winner is the one with the most optimal solution in terms of CPU running time. To determine the winner, I will run every single solution with a reported running time of less than 30m on a MacBook Pro 2,5 GHz Intel Core i7 with 16 GB RAM. No bonus points for coming up with a solution that also works with other board sizes. Even though that would be nice. The code or a github/bitbucket link to the code. The output of the code. An explanation of your approach. The deadline for submissions is March 1st, so still plenty of time. C: 414298141056 draws found in about 5 2.5 minutes. Just simple depth-first search with a symmetry-aware transposition table. We use the symmetry of attributes under permutation and the 8-fold dihedral symmetry of the board. I hope it's not frowned upon to post a solution to one's own challenge, but the reason that I posted this challenge in the first place was that it drove me crazy that I couldn't come up with an efficient solution myself. My best try would take days to complete. Instead of focusing on end positions, I focus on actually playing the game, putting one piece after another on the board. This allows me to build a table of semantically identical positions with the correct count. Realizing the order in which pieces are placed matters: they should be placed such that you maximize the chance of an early win. The main difference between this solution and user1502040's is that I don't use a Zobrist table, but a canonical representation of a board, where I consider each board to have 48 possible transpositions over the characteristics (2 * 4!). I don't rotate or transpose the whole board, but just the characteristics of the pieces. This is the best I could come up with. Ideas for obvious or less obvious optimizations are most welcome! Not the answer you're looking for? Browse other questions tagged code-challenge game permutations fastest-code board-game or ask your own question.